Looking for a quality 12v coffee maker? With so many options to choose from, you’ll be sure to be satisfied with any of these fabulous options and choices. Imagine being able to brew a pot of coffee in under 20 minutes? The Power Hunt 10 Cup 12 Volt Coffee Maker allows you to do just that. Typically, other standard 12 volt coffee makers don’t have a whole lot of power, but the Power Hunt 10 Cup 12 Volt Coffee Maker has all the pour – no more waiting an entire hour for a 12 volt coffeemaker to make one pot of coffee! 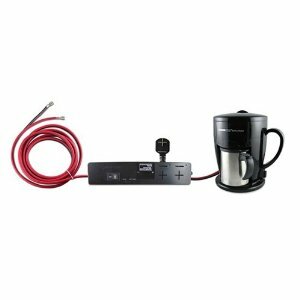 The Power Hunt 10 Cup 12 Volt Coffee Maker actually has it’s own power strip that gives its extra amps of power, making it even more efficient than other 12 volt coffee makers. The 12-Volt Quick Cup Coffee Maker with 16 Ounce Metal Carafe can brew a 16 ounces of coffee in just under 15 minutes – incredible considering how slow a lot of other 12v coffeemakers. The 12-Volt Quick Cup Coffee Maker with 16 Ounce Metal Carafe also brews directly into an accompanying stainless steel travel mug, making it convenient for commuters and people on the go, brewing morning coffee before they go off in the morning. The 12-Volt Quick Cup Coffee Maker with 16 Ounce Metal Carafe also has it’s own high quality reusable filter, which helps save the environment from paper filters and helps you saving money. The RoadPro 12-Volt Coffee Maker is ideal for people who are constantly traveling, or people who are constantly commuting. This coffee maker can plugs right into the 12-volt power port, and will actually brew right into your own stainless steel travel mug. You can also stop at anytime and pour yourself a new cup, and you can get an entire 16oz of coffee in just under 15 minutes. The RoadPro 12-Volt Coffee Maker also has a removable, washable filter, rather than inconvenient paper filters that you constantly have to toss out. The RoadPro 12-Volt Coffee Maker also comes with it’s own little bracket holder, you can even mount the actual coffeemaker in your car or vehicle at any time, and it will be sure to stay put! The RoadPro 12-Volt Coffee Maker also comes with a safety travel lid for on-the-go sipping. it ?aas ?retty much the same page layout and ??sign. Outstanding choice of colors! The RoadPro is crap… If you get a 30 day warranty it will last 31 days… That’s about it.. typical of a RoadPro junk product!